Comprising the essentials needed to begin shooting, the graphite silver edition Fujifilm X-T2 Mirrorless Digital Camera Body with Free Accessory Kit from B&H bundles the versatile camera body with a memory card, an external battery charger, and a camera bag to protect and store your equipment. The special Graphite Silver Edition of the X-T2 features a uniquely durable and aesthetic triple layer coating finish that serves to both protect it and give it visual appeal. Succeeding an initial antioxidant treatment to the magnesium alloy body, a matte black primer coat is first applied. This helps to develop a shadow-like appearance that also accentuates the highlights developed by subsequent coats. The second step in the finishing process involves rotating the body at high speeds while thin strips of paint particles are layered using computer-controlled Thin-Film Multilayer Coating Technology, which produces the smooth graphite silver-colored look. Finally, a clear coat is applied for added durability and shininess based on the ambient lighting conditions. 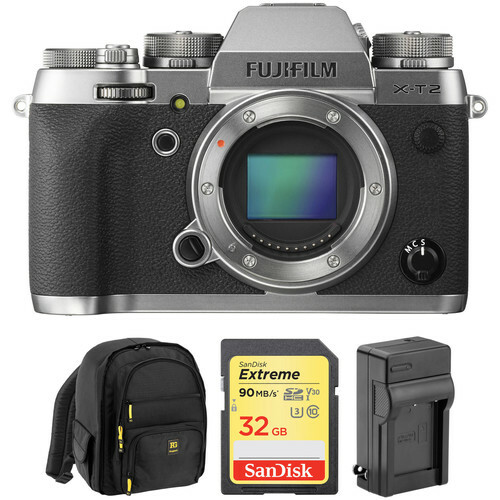 Beyond the unique coating and appearance of the camera, this special edition X-T2 also includes a matching graphite silver EF-X8 shoe-mounted flash, a leather camera strap, and an aluminum hot shoe cover. There are two distinct ways to monitor and compose images on the X-T2, an electronic viewfinder and a rear LCD screen, depending on your particular needs. The 0.5" EVF offers a high 0.77x magnification along with a 2.36m-dot resolution that ensures crisp imagery. Along with these features, the EVF uses an OLED display that provides deep blacks and rich, vivid colors. To ensure a clear view, the EVF offers a base refresh rate of 60 fps which can then be boosted to 100 fps for moments of intense action. The rear 3.0" LCD screen received its own upgrades, especially with the introduction of a three-way tilt mechanism. This allows photographers and videographers to work in a variety of odd angles, including portrait orientation shooting. The screen features a high 1.04m-dot resolution for crystal clear viewing. Blending both phase- and contrast-detection focusing methods, the X-T2 is capable of acquiring focus both quickly and accurately. The entire system is comprised of 325 points, of which there are numerous phase-detection points for faster performance that is beneficial to photographing moving subjects. Approximately 50% of the width and 75% of the height of the imaging area is covered by phase-detection points, too, to offer greater compositional freedom without sacrificing fast autofocus performance. The majority of the frame is then also covered by an apt contrast-detection focusing system that has been quickened by the camera's refined processing power for more versatile control. For refined manual focusing control, Focus Peaking is available to highlight lines of contrast in the scene to more objectively determine sharp focus. Continuous AF modes have been seriously upgraded, as the X-T2 now offers customization of a variety of settings in order to dial in the performance for your specific subject matter. This includes changing the sensitivity, speed, and more to ensure that just what you want to capture is in focus. Supporting its use in harsh climates, the durable weather-resistant body design is constructed from magnesium alloy and sealed to protect against dust, moisture, and cold temperatures down to 14°F. The top plate incorporates a series of locking dials and levers for fast, intuitive adjustment over exposure settings, including a shutter speed dial that offers a mechanical shutter speed range from 1 to 1/8000 sec, as well as bulb and time settings. An ISO dial is also incorporated into the shutter speed dial, for confirming the sensitivity setting without having to turn the camera on. The exposure compensation dial lets you choose +/- 3 EV in 1/3 steps, and a command dial position expands the range to +/- 5 EV for further control. Four-way buttons on the back of the camera have been raised for a more tactile feel. Taking advantage of FUJIFILM's vast history in traditional film-based photography, the X-T2 integrates several Film Simulation modes to mimic the look and feel of some of FUJIFILM's classic film types. For monochrome shooting, the Acros mode offers smooth tones, deep blacks, and fine detail reMiniscent of the Neopan 100 Acros film type. A refined Classic Chrome mode is designed to deliver muted tones and a deep color reproduction, similar to that of a dated slide film. Pulling from their more contemporary line of transparency films, Provia offers natural-looking tones for everyday shooting, Velvia produces a more dramatic and rich tonality with deeper color saturation, and Astia gives less contrast for a softer depiction of skin tones. Mimicking their negative films, Pro Neg. Std. gives smooth image tones that are suitable for accurate color renditions, while Pro Neg. Hi produces a more dramatic feel with the ability to draw color out of a variety of lighting conditions. An electronic shutter function permits using shutter speeds up to 1/32,000 sec for working with wide aperture settings in bright lighting conditions. While most of the X-T2's signature features are built directly into the body, a couple other capabilities can be unlocked with the addition of the optional Vertical Power Booster Grip. This enables faster shooting speeds of 11 fps with autofocus as well as longer video recording times of up to 30 minutes. Additionally, the grip features a 3.5mm headphone jack for audio monitoring. The black Outrigger 45 Backpack from Ruggard holds a standard DSLR system and an iPad. The front pocket measures 8.0 x 7.25" and contains five small, pen-sized slip-in slots as well as a mesh stash pocket. The second compartment is dedicated for your iPad. The third compartment measures 14.5 x 8.5" and contains three memory card pockets, two slash stretch pockets and a key ring. The spacious main compartment for your camera gear includes seven removable dividers that can be configured to accommodate whatever gear you carry. Charge any Fujifilm NP-W126 or NP-W126S type lithium-ion battery with this dedicated Compact AC/DC Charger from Pawa. It runs on 100-240 VAC power, allowing for worldwide use, and features a folding, 2-prong North American plug. Additionally, the charger includes a European plug adapter and a 12 VDC vehicle adapter that plugs into a cigarette lighter port--making it ideal for use both at home and on the road. Works with any Fujifilm NP-W126 or NP-W126S type battery. Fold-out prongs allow for easy storage and traveling. Runs on 100-240 VAC power to enable use all over the world. Features a two-prong North American plug, and includes both a 12 VDC vehicle adapter and a two-prong European plug adapter. Box Dimensions (LxWxH) 8.1 x 5.7 x 5.6"
Box Dimensions (LxWxH) 4.567 x 3.465 x 1.969"
X-T2 Mirrorless Digital Camera Body with Free Accessory Kit (Graphite Silver Edition) is rated 4.8 out of 5 by 402. Rated 5 out of 5 by Kevin from Great camera! I've been really impressed with this camera since I bought it. I kept waiting for Nikon to come out with a mirrorless system like this. I've had my eye on Fuji for a while now. I finally gave in. I love the size of it. And I like being able to take it with me everywhere. I also like the electronic shutter for those situations where I need to be silent and still take pictures. I've had the camera about two months. It's been great. I ended up buying an additional battery. It goes through them pretty fast. I also got a 16mm 1.4 lens and the 56mm lens. Both have been great. The build quality of the camera and lens is solid. I highly recommend it. Rated 5 out of 5 by Alain from Definitely I rented a Fuji XT1 and loved it and when I found out that Fuji was releasing an XT2, I decided to have one and sold all of my Nikon FF system and never regretted . Nikon and Canon are great systems after using them for 40+ years but couldn't handle carrying all this weight on domestic and overseas travel . I wished they had seriously worked on mirrorless system such as Fuji, Sony, Panasonic and Olympus but don't understand their rational, but this XT2 is a marvel and fun and simple to use. It reminds me of my old film camera, Impressive are their well made optics. Bravo Fuji ! Planning to buy the XT20 when available as a backup and addition to my XE2S. Rated 5 out of 5 by Conrad L. from Solid Weather Sealing! I've hard this camera since Dec. 2016 and it's severved me incredibally well. I'm most surprised by the effective weather sealing: This camera got blasted by sprinklers all night as I left it out for a stars time lapse. It was soaked!! I even saw condensation inside the EVF. I forsure thought it was done for, but to my surprise after 2 days of drying is working 100%!! Seriously like it never happened. Additionally this camera is amazing all around - it's so fun much to use, has intuitive controls, and has perfectly capable image quality, and excellent selection of lenses. For the discounted price, it's an amazing purchase! Rated 5 out of 5 by JD from Great Camera I am currently shooting and editing college senior portraits for their senior thesis website and this camera has been my main driver. Plainly, this camera is a beast. With the extended battery pack and the ability to rotate the screen into many different angles for my shots, I can't think of a negative really in performance. MINOR GRIPE: I'm not the biggest fan of the SD card door, I much prefer the X-Pro 2 SD card holder. I also prefer the button layout on the X-Pro 2 as well, but aside from those minor issues, this camera is pretty flawless. Bottom line. The camera isn't perfect, no camera is, but for me it's as close as it gets. Rated 5 out of 5 by Alain from I highly recommend the Fuji XT2 I've been a long time FF DSLR user until my camera had to go in for warranty recall and was left without a camera and really didn't want to use my backup because of high shutter actuations. I rented a mirrorless system and that was history. I got rid of all my DSLR system and decided that Fuji was the only way to go and I have no regrets and in fact it seems that I'm using XT2 more due to its lightness, quality built and great optics and a reminder of yesteryears film camera. The lack for Nikon and Canon not to invest in the mirrorless like Fuji, Sony and Olympus is beyond my understanding. I'm sure they have a reason and I would have gone with them since I already had the optics, but no going back. Rated 5 out of 5 by Anthony O. from The best Camera I've owned I came from a 5d Mark II, III, and still own my Canon 5dsr. Owned almost ever quality L glass Canon Makes. I shoot fashion, real estate, portraiture, and product photography. Taking both the XT2 and my 5dsr to many recent shoots. I'm blown away at the quality, color, auto focus, not too mention it's video quality. Never written a review before. I feel compelled to tell my experience with the Fuji XT2. I was weary of mirrorless, finally I decided to get this And it blows my 50 megapixel dslr out of the water. If you were like me and not sold on mirrorless, I strongly advise you to rent this camera if you can. This is perfection, and will replace my canon body and lenses. Rated 4 out of 5 by Michael from Great for Travel I have been using Nikon equipment for years, but wanted to try lighter equipment for travel. An enthusiastic amateur, I am very pleased with the Fujifilm X-T2, using the 100-400mm lens. Compared to the Nikon D500 and 200-500 lens, picture quality seems similar, but auto-focus is slower on the fuji. For birds in flight, this makes some difference, but I have only used the Fuji for a few weeks, compared to Nikons for five years, so I may still be ascending the learning curve! I will take the Fuji on a planned trip to Madagascar and Africa and possibly update this on my return! Rated 4 out of 5 by Sarah from Beautiful camera! I've been quite happy with both Canon and Panasonic cameras through the years, and now have fallen in love with the Fujifilm X-T2 camera! It is a thing of beauty. There are many pluses to the the X-T2 and just one minor flaw ... its battery has a very very short life. Having been using the Panasonic Lumix GH4 for filmmaking the past 2 years, I've been spoiled with its battery life. The X-T2's battery life is probably 1/10 the life of the GH4 at its best. But that's the only downside to otherwise a gorgeous mirrorless camera! If not for the battery problem, I'd give the X-T2 5 big beautiful stars! On my E2, I feel safe at iso up to about 1600 with no or little noise. How about on X-T2 or Pro-2? I have an X-T2 and 1600 is absolutely fine as far as noise goes, 3200 is really good and I would be happy to go to 6400 when I need to. I am sorry to say that at the time of this posting (February 12, 2017) we do not have an expected shipping date for any new Pre-Orders on this camera. If you have Pre-Ordered the camera already feel free to email cs@bhphoto.com for the most up to date shipping estimate. How long will the battery grip kit be available? It is backordered at the moment, but you can order it and it would be sent out to you as soon as it comes into stock. I currently shoot ballet productions inside of a theater with mixed a low lighting. How does this camera handle this type of shooting? Given the specs of this camera's sensor and processor, this camera, coupled with a quality, fast lens should perform very well for this type of available light shooting. What is the body made of? Is it plastic or metal? Video focus response time?I have the X-E2 and am very happy with the still image quality. Actually, happy with the video image quality but not at all happy with the video focus response or the ability to make adjustments to video focus. I am ready and willing to move up to the X-T2 solve this. I have read that these issues with video focus were solved with the X-T2 but at a local store I counted to 3 before focus would come in on the X-T2 with any lens ie, no better than my X-E2. Help? The X-T2 is a much better camera for focusing in video. You must make sure that the settings are optimized for this. It sounds like the copy you played with has been played with previously and had some settings in place that would make video focusing a bit slower than usual. In the photos the camera has an eye cup. It's not mentioned in the list of what comes in the box. Does the camera come with an eye cup? Yes! It's already attached and weather resistant.